The Most Weird Places On Earth. Stonehenge in Wiltshire, England was built between 3000 BC and 2000 BC and modified throughout several stages the last 5,000 years. Theories abound from the transport and placing of the rocks to the significance of this central meeting point. Still, many gather around this mystic site for the summer and winter solstice every year. Not only were the people, or the Rapa Nui, living in this remote island, they built these 887 giant Moai rock statues, the lightest weighing 86 tons, and were able to move them around from platform to platform around the island. How the Rapa Nui accomplished this feat? We can only begin to guess. 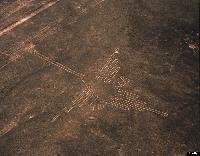 These massive ground drawings in the city of Ica, less than 200 miles south of Perus capital of Lima, measure up to 660 feet. In its entirety, most of them can only seen on airplanes or from observation towers. The reason these drawings exist remain unknown, but the latest theory suggests a labyrinth for spiritual journeys. Very little is known about the people who lived in the city of Teotihuacan. About 30 miles northeast of Mexico City, it was the greatest city in the Western Hemisphere before the 1400s, the Mayans, and the Aztecs. The Aztecs, after discovering the city, named it Teotihuacan, the place where god were created. 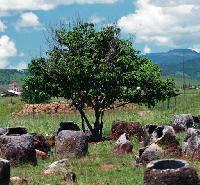 Measuring up to 10 feet in height, these jars are spread out in clusters all across the Xieng Khouang province of Laos. In some of these clusters, there are over 250 jars. Some believe they were used as burial sites, or according to legend, giants may have used these jars to store their alcohol. Its the only wonder of the ancient world that exists today and were not any closer to understanding the details of how the ancient world accomplished this extraordinary feat. This religious site in Urfa, Turkey was built in 10,000 BC, predating the Great Pyramids by 7,000 years. Excavations only recently started in 1995, but many questions have already come up. In an age when only hunter-gatherers roamed, how were they able to build such complex structures? This forest is known as the Bermuda Triangle of Romania. Multiple people have gone missing in it, people have sighted UFOs, there has been unexplained electrical phenomena and more. The Parisian catacombs are a giant ossuary and cemetary that are located beneath that citys streets. There are approximately 6 million bodies put to rest in the catacombs. There is a city of the dead waiting to be explored beneath the city of lights. The M?tter Museum is an institution dedicated to medical anomalies. It houses organs, bones, fetuses and statues thatll leave you with chills. Its medical oddities, anatomical and pathological specimens, wax models, and antique medical equipment are world-famous.